Mandriva Linux (formerly known as Mandrake Linux) was created in 1998 with the goal of making Linux easier to use for everyone. At that time, Linux was already well-known as a powerful and stable operating system. With this innovative approach, Mandriva offers all the power and stability of Linux to both individuals and professional users in an easy-to-use and pleasant environment. Thousands of new users are discovering Linux each and every day and finding it a complete replacement for their previous operating system. Linux as a server or workstation has no reason to be jealous of any other more established operating systems. Free/Open Source Free Software licensing govern the development and redistribution of Mandriva Linux. FOSS licensing provides everyone the right to copy, distribute, examine, modify and improve the system as long as the results of these modifications are returned to the community. It is this development model that allows Mandrivalinux Linux to collect the best ideas from developers & users from across the globe to result in a rich variety of techniques and solutions. Improved boot performance – Through various tweaks and hacks, the boot performance has been greatly improved since Mandriva 2009 Spring. The suspend, resume, hibernate and shutdown functions are also a lot faster. Amazing new boot splash – Powered by Plymouth, the new boot splash looks much better than in previous releases of Mandriva Linux. 4 new themes – Mandriva 2010 comes with four themes, one for each edition (Free, One, Powerpack and Flash). 10 new, beautiful wallpapers – Both KDE and GNOME desktops include many new and interesting wallpapers from various photographers around the world. The KDE 4.3.2 desktop environment – as the default desktop, KDE 4.3 comes with the beautiful Air theme, Plasma enhancements, file previews and video thumbnails in Dolphin, new effects, new Plasma widgets, Nepomuk integration, KDE 3 data migration support, Amarok 2.2, KMess 2.0.0 instant messenger for MSN Live, KOffice 2.0.82 and Digikam 1.0. The GNOME 2.28.0 desktop environment – Available in the GNOME One Live CD, it offers better Webcam and Bluetooth support, an improved Time Tracker panel applet, the Empathy instant messenger, the Epiphany web browser, the Evince document viewer (with support to save and edit annotations), the Pitivi video editor, improved Totem (with DVD navigation and playback resume support), better GNOME Power Management that supports multiple batteries on laptops and hard disk spindown, Snowy sync support for Tomboy, and many more. 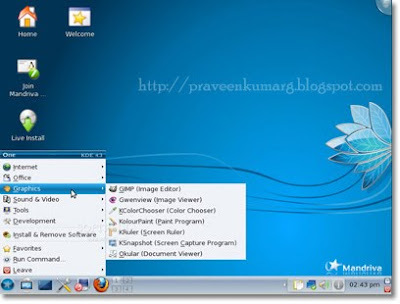 Moblin support – Mandriva Linux 2010 is the first Linux-based operating system to include a full Moblin environment. The “task-moblin” package needs to be installed. After that, choose “Moblin” from the session list in the connection manager. Support for modern netbooks -The support for hardware components found in latest netbooks on the market, such as Asus Eee PC models, the Acer Aspire One or the MSI Wind, has been greatly improved. Mozilla Firefox 3.5 – As the default web browser, Firefox 3.5 offers an improved performance, support for HTML5 <> and <> tags, support for Ogg Theora videos, support for Ogg Vorbis audio streams, private browsing mode, location sharing and new themes. OpenOffice.org 3.1.1 – Everything is improved in this release, from the Microsoft Office 2007 filters, the screen appearance, the file locking, the Comments, the Calc performance, KDE4 and the grammar checker integration. VirtualBox 3 – The latest version of the powerful and free virtualization software from Sun Microsystems offers Guest SMP for no more than 32 virtual CPUs, support for playing Direct3D 8 and 9 games on Windows guest machines, support for OpenGL 2.0 for Linux, Solaris and Windows guests. USB Startup Disk Creator -Just like Ubuntu, Mandriva also provides a little tool, called Mandriva Seed, to make a bootable USB stick that will help you install Mandriva Linux 2010 on netbooks or workstations without a CD-ROM device.